Giving birth is an emotional and often traumatic experience even when things go well, but what about when it goes wrong? Up until now, no-one has ever asked parents who have experienced stillbirth or the death of a baby shortly after birth what they felt about the care they received. Finally, however, their voices are being heard. A survey of more than 700 bereaved parents by Oxford University shows that a significant number are being let down at a devastating time in their lives. Claire Kerry, 36, is one of those parents. She was 10 days overdue with her second child in February 2012 when she went into labour. Many hours later in a birthing pool in her local hospital, her daughter Esther was stillborn after the umbilical cord became tightly wrapped around her neck and body. "We had heard her heart beat just 10 minutes before. She was a healthy, strong girl of eight pounds three ounces, she was beautiful," Claire says. But she could not be resuscitated. Claire and her husband, from the Midlands, say that although the care they received during Esther's birth was good, it was the way they were treated afterwards that left them feeling isolated and angry. A bereavement midwife, who is trained to deal with bereaved parents, was kind and comforting at the time but the photographs which were taken of Esther and should have been sent to Claire as a memory of her daughter, never arrived. She had to chase them up and eventually they were located in the bottom of the bereavement midwife's drawer. Ten months after Esther's stillbirth, the photos were delivered, but "they weren't the special memory they were supposed to be by then," Claire whispers. At a follow-up appointment just weeks after losing their daughter, they were made to sit in a waiting room with expectant mothers, only to be told by an intimidating line-up of doctors and nurses - none of whom were present at the birth - that Esther's death was "just one of those things". "It wasn't nice at all. We felt so disempowered. We were still stunned and shocked by what had happened." Back at home, midwives came on two occasions to check Claire's stitches and she was discharged, with some leaflets to read. Her GP left a message on her phone asking if she needed anything. But that was it. "I felt so isolated - as if all the doors had been closed on me. You need people more than ever at that point. "I'd still had a baby, but no-one came." Claire found herself in freefall. She became very low and depressed as the impact of her loss began to take hold. Friends and family just didn't know what to say and it was only a series of psychotherapy sessions which helped pull her slowly out of that dark place. Claire's experiences are not dissimilar to those of many parents in Oxford's 'Listening to Parents' study, which collates 720 women's experiences of maternity care after bereavement across England. The results, which will be presented at a meeting of the Royal Society of Medicine, suggest that the care provided is generally good but they also reflect a wide variation in the quality of care provided by hospitals and individual health professionals. During labour, the survey found that 10% of women said they did not feel listened to or that their concerns were taken seriously. Nearly a third said they did not feel they had a part in decision-making and almost half said they did not feel fully confident about the decisions made at the time. Some parents reported being taken to rooms within maternity wards after the birth and being able to hear other babies crying, which they found extremely distressing. While some staff are praised for their compassion, others are described as insensitive and uncaring. Lead researcher Dr Maggie Redshaw, from Oxford University's National Perinatal Epidemiology Unit, says it is important to hear bereaved parents' voices and learn from them. "Death and bereavement is a very big deal for young parents when they have hopes for the future. They set out on a path to be a parent and what happens is a huge shock." This can have a long-lasting psychological impact, she says. 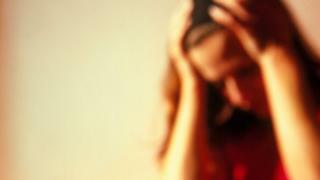 Bereaved parents reported being depressed and suffering from anxiety at much higher rates than the general population. Dr Redshaw says care should not stop when parents leave the neo-natal unit. Support and counselling could be improved, and is often needed long term. But perhaps more could be done to help prevent stillbirth happening in the first place. Janet Scott, head of research and prevention at Sands, the national stillbirth and neonatal death charity, says parents' concerns must be listened to. "'I knew something was wrong' is a terrible burden for parents to carry. "Parents need to feel there is someone they can speak to, who will listen to their anxieties before and during labour. "They should be made to feel their concerns are valid." The study's conclusion urges midwives, GPs and consultants to listen to the views of parents who have experienced the death of a baby, so that "some of the unacceptable experiences described" can be avoided. Claire knows it can make all the difference. Since Esther's death, she has had a miscarriage and was treated at a different hospital where her experience was very positive. "I was treated like a human being. It made me realise just how badly we were treated before."